To successfully propagate your seeds, you will need some basic supplies. If you are on a budget, you can transform household materials like yogurt cups into seedling containers and plastic spoons into labels. Otherwise, basic propagating materials like containers, planting mixes, and labels are available at garden centers and hardware stores. Mail-order stores that specialize in gardening will also carry basic seed-starting products and more sophisticated supplies. The container is an important consideration, as it will form the environment in which you propagate your seeds. The container you choose will have an effect on space and moisture requirements. Therefore, it is important to choose the type of container that best suits the seeds you are propagating. Small containers that are one or two inches in diameter are good for single seedlings or cuttings, while several seeds or cuttings can be placed in pots that are six or eight inches in diameter. Containers can be made from plastic, clay, or biodegradable materials such as peat, that can go directly into the ground without disturbing the seedling's roots. No matter what kind of pot you choose, make sure it has drainage holes in the bottom. You'll be placing your seeds in soil or a potting mixture. A good potting mixture should have a combination of minerals, organic material, air, moisture, and a microscopic community of subterranean life. 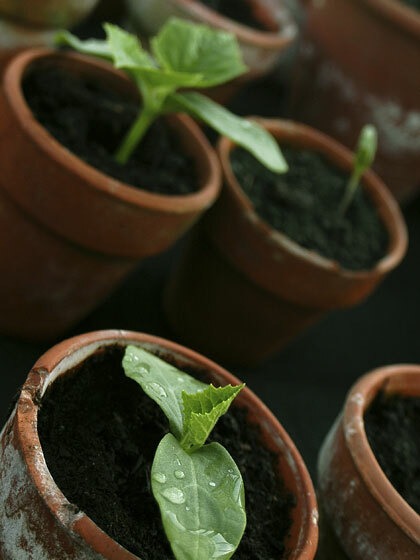 Once your seeds are placed in their soil-filled pots, they will need to be watered. Water carefully, as most seeds don't like being overwatered or underwatered. You can use a garden hose, sprinkler, or watering can to water your seeds, though fancier methods such as bottom watering, using a water wand, using a rubber sprinkler, a wicking or capillary mat, misting, or drip and trickle irrigation are other options. 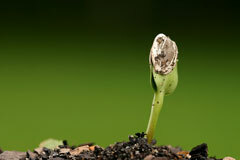 Once your seed is planted, it will germinate if all goes well. 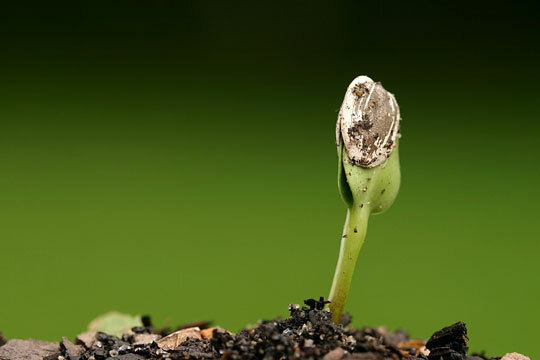 Germinating is when growth begins, and the seedling emerges from the seed. In addition to the right soil and amount of water, the seed will also need light. The intensity of the light needed will vary from plant to plant. For some plants, windowsill light is enough, while others require a light garden. Your best bet is to read the back of the seed packet for light requirements.